Wyss Institute researchers and a multidisciplinary team of collaborators seek to build and link 10 human organs-on-chips to mimic whole body physiology. 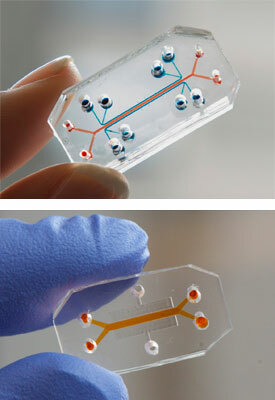 The system will incorporate the Institute’s Human Lung-on-a-Chip (top) and Human Gut-on-a-Chip (bottom). BOSTON — The Wyss Institute for Biologically Inspired Engineering at Harvard University today announced that it has entered into a Cooperative Agreement worth up to $37 million with the Defense Advanced Research Projects Agency (DARPA) to develop an automated instrument that integrates 10 human organs-on-chips to study complex human physiology outside the body. This effort builds on the Institute’s past breakthroughs in which Institute researchers engineered microchips that recapitulate the microarchitecture and functions of living organs, such as the lung, heart, and intestine. Each individual organ-on-chip is composed of a clear flexible polymer — about the size of a computer memory stick — that contains hollow microfluidic channels lined by living human cells. Because the microdevices are translucent, they provide a window into the inner-workings of human organs without having to invade a living body. The Lung-on-a-Chip, which makes use of living human cells, mimics the lung’s tissue-tissue interface and breathing motions. Wyss Founding Director, Donald Ingber, M.D., Ph.D., and Wyss Core Faculty member, Kevin Kit Parker, Ph.D., will co-lead this five-year project. Ingber is also the Judah Folkman Professor of Vascular Biology at Harvard Medical School and the Vascular Biology Program at Boston Children’s Hospital, and Professor of Bioengineering at Harvard’s School of Engineering and Applied Sciences (SEAS). Parker is the Tarr Family Professor of Bioengineering and Applied Physics at SEAS. The organ-on-chip program will also draw on the Institute’s leading scientists and engineers, including Geraldine Hamilton, Ph.D., Anthony Bahinski, Ph.D., and Daniel Levner, Ph.D., who have extensive industrial experience in drug development, safety pharmacology, and systems engineering, to accelerate translation of this technology from the lab into the marketplace where it can best help the people who need it most. Other key collaborators participating in the project include John Wikswo, Ph.D., University Professor of Physics at Vanderbilt University, and Andrzej Przekwas, Ph.D., from CFD Research Corporation.